To get the vRealize Operations OVA uploaded and installed on Ravello Systems, read my previous post about how to do that. Once you’ve got the VM added to your Ravello application, you’ll need to configure a couple of things so that it starts correctly at boot time. vRO has a web console, and to get at it, you need the Ravello platform to connect the outside world to your private lab network. This is done using what Ravello call Services. You can find the services panel on the far right of the screen when the VM is selected in any of the major views. The Services panel of the vRO VM, selected in Canvas view. Here you can see the VM has a single Supplied Service: the HTTPS protocol on the default port 443. It’s marked as External which tells the Ravello platform to connect it to the external IP address of the VM when it’s set up on whichever cloud platform it ends up running on. Note the IP address is set in the pulldown; you don’t get to pick which IP the service is connected to here. That’s because the VM gets its IP address from DHCP. vRO needs an IP address, and we want it to have the same one each time. We do this with a DHCP address reservation. While you could use a static IP address, that requires making changes to the VM itself to configure the static IP address. If we use a DHCP reservation, we don’t have to touch the VM itself because by default it picks up its IP address from DHCP. The address 192.168.199.3 is a good choice if you’re connecting vRO into an AutoLab environment. Save the configuration, and Update the application. You can now connect to the web console over HTTPS when the VM is running. Select the Summary panel, and look at the bottom near where it says VM is Started, and you should see an item that says Ports: 443 (vro) and to the right of that, a link called Open. If you click on Open, a new tab/window will open to the web console when the VM is running. 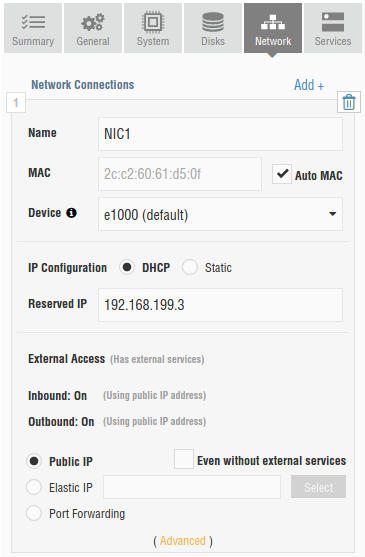 Now you can configure the appliance through the web console as normal, once it has booted. Ah, but booting on Ravello has an annoying wrinkle, so let’s look at that. This is a drag for something that needs to start up regularly, like in Ravello, so we want to disable this boot check. This is easy to do, but you need to get into the VM itself to edit it. Open the VM console with Ravello, and use the Show Keyboard feature to enter ALT-F1. This selects a TTY you can log into the VM with. Log in as root with the password you configured for the appliance in the web console setup. 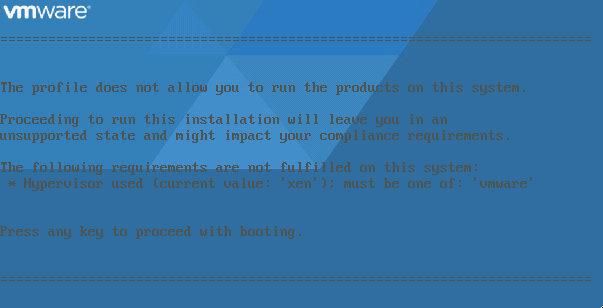 The boot check is done by a file called /etc/init.d/boot.compliance, and it’s common to a lot of VMware appliances, so this trick works for other appliances, too. Either remove all links to this file in the /etc/init.d/ directory hierarchy, or edit the file so it exits straight away. Now the appliance will just boot up all the way to a running state whenever you power on the VM. Tagged AutoLab, ravellosystems, vmware, vRealize, vRO.